I've known many wonderful dogs throughout my life, but Lucy was the one with the biggest hold on my heart. I found her as a stray when she was 8 months old and to my good fortune, no one ever claimed her. Lucy was diagnosed with an aggressive oral melanoma when she was 11 years old. I had noticed her breath had suddenly become offensive. When I examined her mouth I noticed the gums around a tooth were swollen and appeared ruptured. I had thought perhaps she had an infection from an abscessed tooth. Concerned an infection would get into her bloodstream I took her to an emergency vet who advised it was a tumor. The following day she went to her regular vet who confirmed it was a tumor, biopsied it, then once the cancer was confirmed preformed a surgery to remove it. The tumor was located on the left side of her upper palate, approximately 2" long. She had had an annual exam just 4 months earlier and nothing was detected at that time. They were only able to remove 80% of the tumor. I had been advised that an attempt to remove the tumor may stimulate growth but that surgery was still recommended in this case. Unfortunately, the remaining portion of the tumor did grow at an alarming rate. I could notice the change on a daily basis. Waiting for appointments with specialists while witnessing the growth was disheartening. First we saw an internal medicine specialist, who advised the "the golden standard" for care would be to remove 1/2 of her upper palate and surrounding areas (basically half her face). Given her age I did not consider this a realistic option. She did not offer any other possible treatments and advised the best course would be to make her comfortable for her remaining months. I was advised it could be 3 to 6 months. I sought an opinion from an oncology specialist who was doing work with an experimental melanoma vaccine. He agreed with not performing the surgery and recommended a 6-week treatment plan receiving the vaccination on a weekly basis coupled with radiation twice weekly. However before he would begin treatment he insisted she be examined by a cardiologist. At the age of three, Lucy was diagnosed with a sub-aortic stenosis but had continued to live very well with the condition. With the medication, her heart condition actually improved with age. It was frustrating waiting to begin treatment, as each appointment with a specialist was at least a one week wait. Every day I could see the tumor grow in size. I begged the oncologist to start treatment without further examination but he was concerned about the risks. The cardiologist confirmed her condition was fine to move forward with treatment. It took a little over 3 weeks after the initial surgery in January to begin radiation and the vaccine treatment. X-rays at the time of surgery did not indicate the cancer had spread to lymph nodes. New X-rays were not obtained prior to starting treatment but I was hopeful that it did not spread in the weeks waiting to start. The radiation successfully shrank the tumor in the local area. Almost immediately after the first treatment Lucy began to behave like her old self - chasing her tail and playing with toys. I finally saw signs of hope. However as the treatment continued she did encounter rather severe side effects from the radiation. By week three/four, the inside of mouth became raw and covered with mucus. All the hair under her jaw on the neck was gone. She continued to eat though she was no longer playful. The radiation side effects did begin to subside; however other issues developed. Lucy developed Horner's syndrome in her eyes and it was later determined that the cancer had spread to her lymph nodes. In her case the vaccine was not effective. Initial surgery was in late Jan. The treatment started in mid Feb., radiation severe side effects mid March, Lucy was put to rest April 1. It was a heartbreaking decision - she still showed an interest in eating yet wasn't eating. She would get up and go to the fridge every time it opened. She still got up to greet people, still wagged her tail at the sound of a familiar voice and enjoyed napping by your side. But she was not going to get better, her quality of life was going to continue to decline and I didn't want her to waste away. In hind sight, I don't think I would have tried the initial surgery to remove the tumor but who knows if that would have changed anything. She turned 12 while undergoing treatment and I was blessed to have known her for 11 wonderful years. Take lots of photos and videos of your dogs, it will bring you comfort when they're gone. I hope others have more success with their treatments. I am beyond myself in grief. My intent now is to only make his life as comfortable and happy as possible. I try my best to stay in the moment with him. Not always successful, yet how else does one deal? Your story brought me peace and I know I am not alone, although many times it seems that way! I am saddened to read about the loss of your Lucy, she is beautiful in her photo. I too lost my golden retriever Erin on Sept. 11 of last year and it still hurts to think or talk about it. Erin also held a special place in my heart and always will. 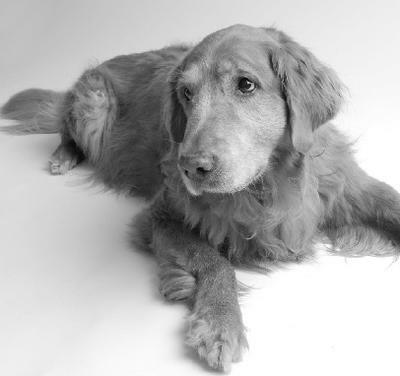 She fought her hemangiosarcoma for a year and a half with the help of treatment. We were lucky that she felt good until the last few days and she passed at the age of 12. I understand and share your loss and sadness - I am just now starting to think about her without crying. I wish you peace. I'm so sorry for your loss. Lucy was a very lucky girl to have found you. Thank you for sharing the battle with Lucy's Oral Melanoma. My 12 year old rottweiler has recently been diagnosed with an oral melanoma and I have been advised that surgery is not recommended due to the chance of increasing the growth rate of the tumor. After reading your story I am feeling better about doing nothing (though it's hard to do nothing!). At this point there's no signs of spread to her lungs/lymph. She continues to eat well, play and go for her daily walk. The battle I'm having is infection of the tumor. Constant antibiotics isn't something I want for her either. I'm rinsing it 2-3x per day though it doesn't seem to help much. Thanks again for sharing Lucy's story. May your memories of your special girl be in your heart always.